Lisa M. Najavits, PhD, is currently Adjunct Professor at the University of Massachusetts Medical School and previously was on faculty at Harvard Medical School for 25 years and Boston University School of Medicine and the Veterans Affairs Boston Healthcare System for 12 years. She is author of over 180 publications, including the books Seeking Safety: A Treatment Manual for PTSD and Substance Abuse (for mental health professionals) and Finding Your Best Self, Revised Edition: Recovery from Addiction, Trauma, or Both (for general readers). She is Director of Treatment Innovations, which conducts research and training related to mental health and addiction. Dr. Najavits serves on the boards of numerous journals, including the Journal of Traumatic Stress, Journal of Gambling Studies, Journal of Dual Diagnosis, and Psychological Trauma, and has received awards including the Betty Ford Award from the Association for Medical Education and Research in Substance Abuse, the Emerging Leadership Award from the Committee on Women in Psychology of the American Psychological Association, the Early Career Contribution Award from the Society for Psychotherapy Research, and the Young Professional Award from the International Society for Traumatic Stress Studies. She also served as president of the Society of Addiction Psychology of the American Psychological Association. Her major clinical and research interests include addiction, trauma, co-occurring disorders, community-based care, veterans' mental health, development of new counseling models, and clinical trials research. She has a private psychotherapy practice in Massachusetts. 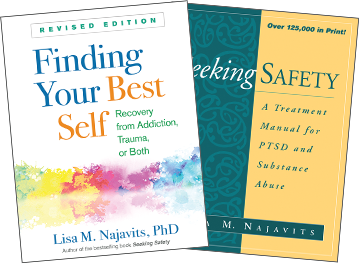 Sign up for e-alerts on upcoming titles by Lisa M. Najavits (with special discounts)!